England manager Roy Hodgson’s preparations for the 2012 European Championships have again been disrupted by injury and scandal. In England’s workmanlike 1-0 win over Belgium on 2 May, Chelsea centre-half Gary Cahill’s was ruled out of the Euros when he sustained a double jaw fracture. It was the third injury to strike since the squad was announced (Frank Lampard and Gareth Barry have already been ruled out). Hodgson’s subsequent decision to bring in Liverpool’s inexperienced youngster Martin Kelly ahead of Manchester United starter Rio Ferdinand to replace Cahill has caused much controversy. 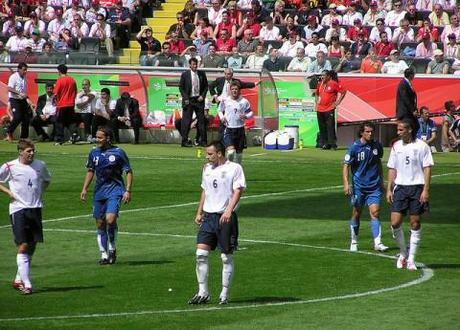 Hodgson insisted that the original decision to leave out Ferdinand was purely down to “footballing reasons” but few in the sports commentariat believe Kelly is a better option than Ferdinand and many continue to suggest that Hodgson has overlooked Ferdinand due to the player’s reported rift with John Terry. Terry has been charged with the racist abuse of Ferdinand’s brother, Anton. Terry pleads innocent to the charge. Ferdinand, who has 81 caps compared to Kelly’s one, tweeted “What reasons??!! !” when he was ignored again. Football reasons? Pull the other one Roy. “Jeopardise the coherence of the group for his fourth, maybe fifth-choice center half? What manager would make that call?” asked Martin Samuel of The Daily Mail. Writing at Goal.com, James Goldman argued that Gary Cahill‘s fractured jaw “has brutally exposed the folly of ignoring Rio Ferdinand’s Euro 2012 credentials on supposed ‘footballing reasons.’” “What on earth has the most accomplished England defender of his generation done to deserve being ostracised in such an undignified manner?” questioned Goldman, who said Kelly’s call-up constitutes the “the ultimate slap in the face” for Ferdinand. Hodgson “has messed up badly over the Rio Ferdinand affair, according to sources within Kick It Out,” reported The Sun. “The anti-racism campaigners — partly funded by the FA — believe the England boss should have got Ferdinand and John Terry together before selecting his Euro 2012 squad,” added the tabloid in an exclusive article.